Age : 23-35 years as on 01/01/2014. age relaxation as per Govt. of Rajasthan rules. 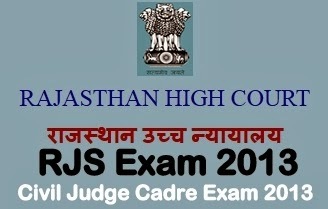 Qualification: No Candidate shall be eligible for recruitment to the service unless he holds a degree of Bachelor of Laws (Professional) of any University established by law in India and recognised as such under the Advocates act,1961 AND Knowledge of Rajasthani dialects and social customs of Rajasthan. How to Apply : Eligible candidates should go through detail Notification at Rajasthan High Court (HC), Jaipur (www.hcraj.nic.in) website and apply as per instruction. Log on to http://www.hcraj.nic.in and click on link" Recruitment - Civil Judge Cadre, 2013" to access the home page of the online application portal or log on directly to http://rhcexam.raj.nic.in Applicants are required to apply only through Online Mode, no othermeans/mode of submission of application form will be accepted . Apply Online on or before 18th December 2013.